YAGP Is Turning 20. But First It Had to Change the Ballet World's Opinion of Dance Competitions. Larissa Savliev teaches class at YAGP. Courtesy YAGP. It's hard to imagine the ballet landscape today without Youth America Grand Prix. The annual competition attracts thousands of young dancers from all over the world, many hoping to win a scholarship to a major ballet school. This year, which marks the organization's 20th anniversary, roughly 12,000 students participated in YAGP's semi-finals in 32 cities here and abroad, and over 1,000 are in New York City this week for the final round. The stage at last night's Stars of Today Meet the Stars of Tomorrow gala was packed during the student defilé (kudos to them for not knocking each other over! ), while top alumni—including Kimin Kim, Isabella Boylston, and Hee Seo—made triumphant returns. In recent years, other scholarship competitions have popped up around the country. But before YAGP was founded 20 years ago, it was a much different story. For bunheads, "competition" was almost a dirty word, one associated with back flips, hulking trophies and flashy jazz studios. And that's exactly where YAGP co-founder Larissa Saveliev found herself in the late '90s. She and her husband, YAGP co-founder Gennadi Saveliev, had defected from Russia a few years earlier, and the former Bolshoi Ballet dancer and new mom was teaching ballet at a studio in New Jersey. On weekends, she would travel with the school to jazz competitions, an experience she found deflating. The Mariinsky Ballet's Maria Khoreva. Svetlana Avvakum, Courtesy Kennedy Center. Before Maria Khoreva danced her first performance as a member of the Mariinsky Ballet, she was already a superstar, with devoted Instagram fans following her life as a pupil in the Vaganova Academy (follow her @marachok). Her talent was already obvious—as were her exceptionally long lines, elegant technique and charisma—and when she joined the company's corps de ballet last summer, it was apparent that her artistry was also far beyond her 18 years. Khoreva didn't last long in the corps: in November artistic director Yuri Fateev promoted her to first soloist, the Mariinsky's second-highest rank. Not even one year into Khoreva's professional career, her repertoire already includes the title role in Paquita, the lead in Balanchine's "Diamonds" and Terpsichore in his Apollo, plus Medora in Le Corsaire, which she is performing this week during the Mariinsky's annual tour to the Kennedy Center. Between performances in Washington, D.C., we spoke to Khoreva via Skype about her life in ballet, overcoming injuries and keeping in touch with 300,000 friends on Instagram. Natasha Razina, Courtesy Kennedy Center. Khoreva and Xander Parish rehearse Apollo during the Balanchine: The City Center Years festival in New York City last October. Orlando Ballet in Arcadian Broad's Wonderland: Mad Tales of the Hatter. Michael Cairns, Courtesy Orlando Ballet. Rubén Martín Cintas and Diego Cruz. Courtesy Cruz. It started with a weekly tradition among friends. 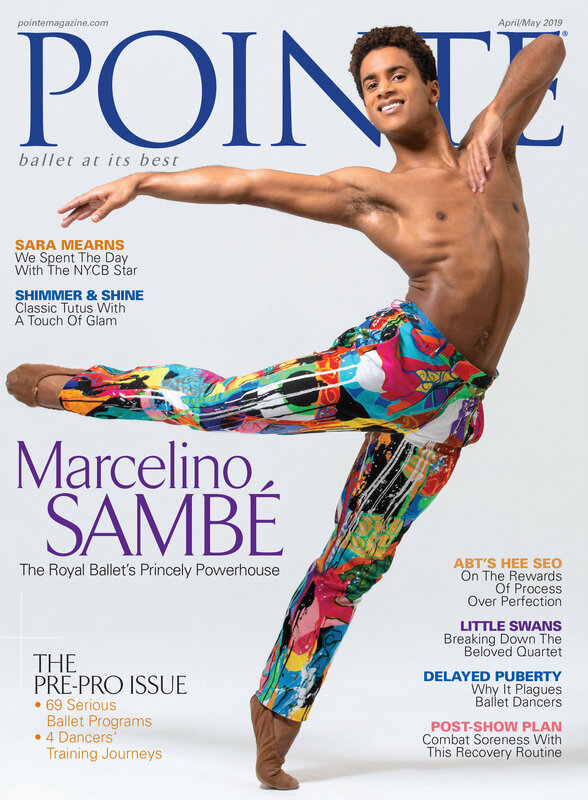 "We have Mondays off, so we would do P+P—paella and poker," says San Francisco Ballet corps member Diego Cruz. After nearly ten years honing home-country recipes, Cruz and his co-founder, former SFB principal dancer Rubén Martín Cintas, decided to take their cooking skills commercial in July 2017. Today, Paellas & Cos can barely keep up with their client demand on two coasts: San Francisco's Bay Area and Washington DC, where Cintas recently relocated to serve as Ballet Master for The Washington Ballet. Cruz in Helgi Tomasson's Concerto Grosso. Erik Tomasson, Courtesy SFB. Cintas in Helgi Tomasson's Nutcracker. Erik Tomasson, Courtesy SFB.